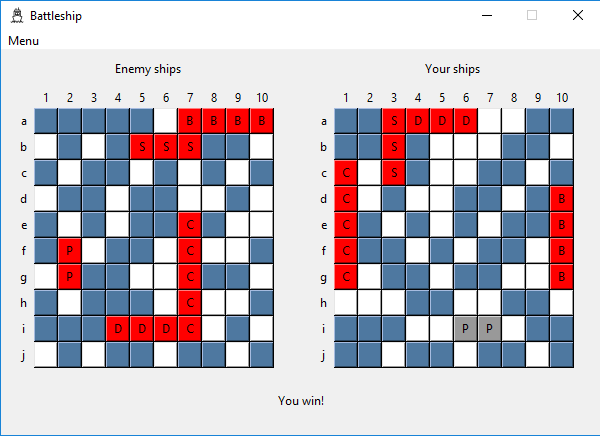 A simple solitaire Battleship game. Programmed in Python 3.6 by Seth Borgo in 2018. The download file is an installer that simply creates a folder containing the game files. The default path is C:\Program Files\Battleship. The installer does not create desktop or start menu shortcuts. To play the game, go to C:\Program Files\Battleship and double click on Battleship.exe, or create a shortcut. An icon file is provided in the Battleship folder for shortcuts. By installing you are agreeing to the terms in the EULA. Installer does not create desktop or start menu shortcuts, user must create them manually if desired. This page was last modified on 22 April 2019, at 10:05.